or you can order directly from ring.com/pro. 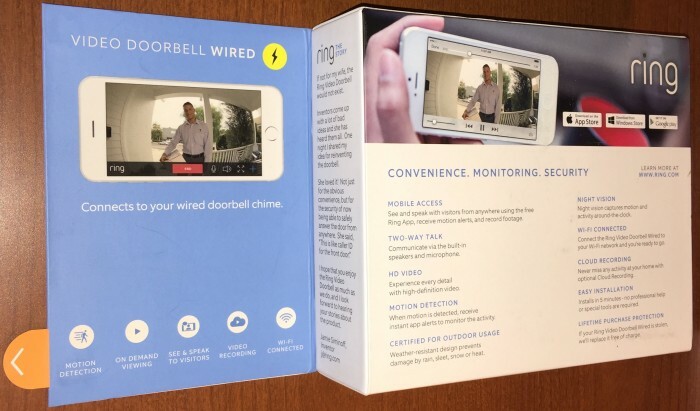 I like the idea of the Ring Video Doorbell, having read many articles, and pored over dozens of the thousands of Amazon reviews. I also had heard months of podcast mentions, and the excellent recent interview of founder/inventor Jamie Siminoff by Jim Collison @jimcollison of the Home Gadget Geeks podcast. I knew full well that I might run into some early adopter rough-edges. This is a new product category, after all. But I was curious enough to give it a try anyway, as was my wife, who saw the Costco in-store display pictured in the tweet below. We agreed there are times where it could be very useful to know who is stopping by, or making a delivery. I was also getting a bit fed up with having to replace my front doorbell button every 3-4 years due to a burnt out bulb, with a recent LED illuminated model I installed last year proving to be kind of shabby-looking, with a very uneven and cheap looking glow. In the end, after about 3 weeks of ownership and daily use, I decided to return my Ring, Wi-Fi Enabled Video Doorbell with Chime – Satin Nickle Finish, despite the great price at Costco back in mid February 2016 of only $179, bundled with a WiFi connected chime. To repair the 4 small holes, just putty and paint. Done. For now. Lag - More than two thirds of the time, my delivery person had rung the bell, but the recorded video began only once they were walking away, already at least 20 feet away. I realize my WiFi signal strength, and the time to connect from a sleep state, could be partly to blame. Sure wish there was a video recording buffer to help counteract the lag, or better still, take advantage of my wired doorbell's constant voltage supply to stay connected to WiFi, ready to record. Motion Detection - Unfortunately, no matter what sensitivity or directionality settings I tweaked, I couldn't leave this feature enabled. Simply too many false alarms. WiFi - 2.4 GHz only. Seems almost like a bit of planned obsolescence, as I'd like to eliminate all 2.4 GHz devices from my WiFi as soon as possible. Same complaint I made about my ecobee3, but I realize that for some folks, using the 5 GHz channel might not have the same reach. Not likely an issue for my home. Confidence - my first unit was DOA. Got it home and couldn't get it to power up, even after a charge. I realize every product has a certain level of DOA. I did start to think that I might be better off waiting for ring's next-generation. Cosmetics - a bit on the bulky side, with the nickel finish making it a bit too prominent. 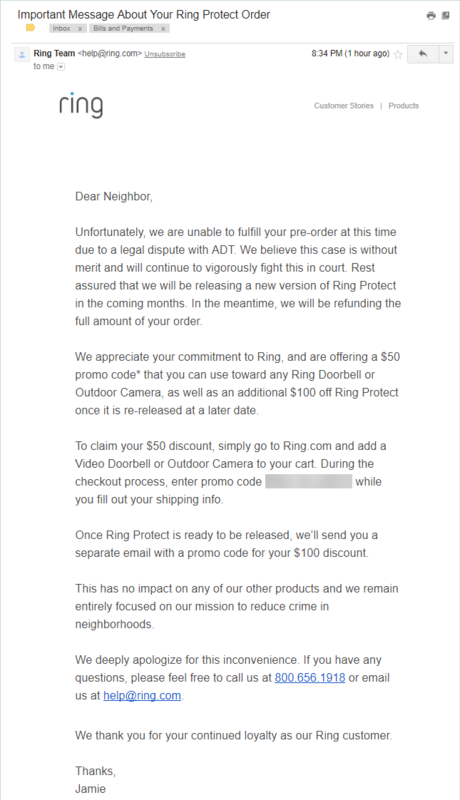 Timing worked out in my favor, to my delight and surprise the next generation product, the Ring Video Doorbell Pro was announced on March 13 2016. The new Pro version seemed to address each of my concerns. This came just in time for me to visit the always friendly staff at the Costco returns desk, well within my return window. Again. Motion Detection - Ah, truly tunable zones based in the image, now we're talking, hope it works out for my home's front yard layout, see also the demo video loops at Ring here. Confidence - Next generation product, incorporating all previous generation's early adopter feedback. Cosmetics - Slimmer, and includes 4 colors of faceplates to choose from after the sale, that makes sense! I'll probably go with the (slightly-off) white thank you, to make it blend in better with my white-trimmed front door. After a discussion with my wife to explain the Pro's new features, and higher cost, I then placed our new pre-order directly from ring.com/pro, that same evening, March 16th. 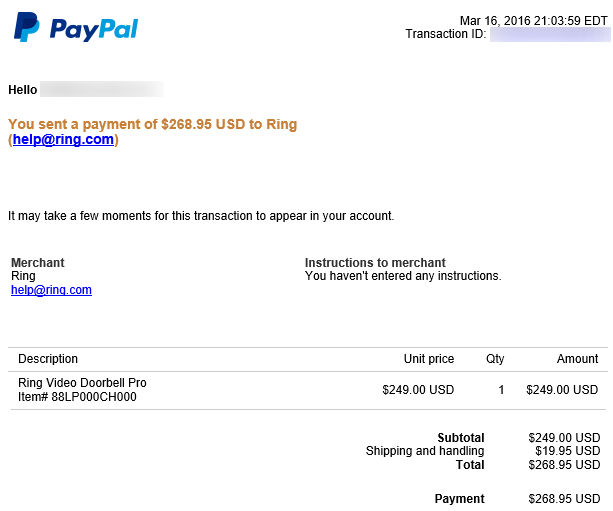 At 2:49pm eastern time today, I received email from Ring announcing "Your Ring order has shipped!" Once I clicked on the tracking button, turns out it was already in my mailbox, delivered via USPS this morning. Just as Ring had promised during the pre-order, an April delivery. Important to mention that retaining the video as cloud-based (downloadable) recordings are not free. You do get a free 30 day trial, after which you can sign up for $3 per month, or $30 per year. 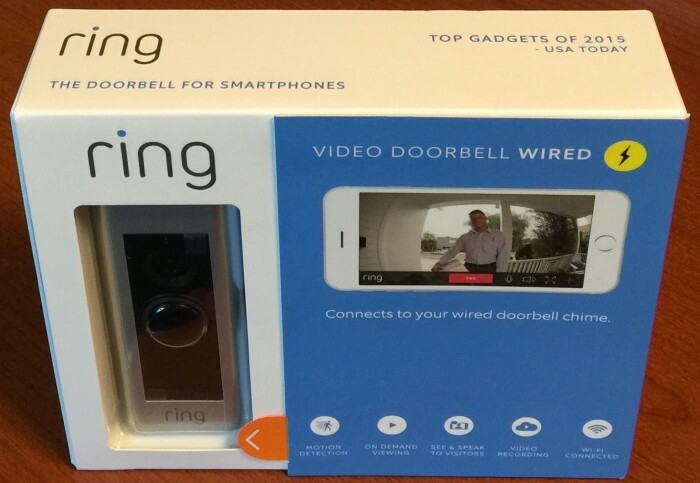 If not for my wife, the Ring™ Video Doorbell would not exist. Inventors come up with a lot of bad ideas and she has heard them all. One night I shared my idea for reinventing the doorbell. She loved it! Not just for the obvious convenience, but for the security of now being able to safely answer the door from anywhere. She said, "This is like caller ID for the front door." I hope that you enjoy the Ring Video Doorbell as much as we do, and look forward to hearing your stories about the product. You can pretty much see what's inside. Good technical summary, right on the back of the box. You know me: unboxing video first, then testing it out for a bit, recording video, writing a little something about those first impressions, revisiting the article to give updates. That's just what I do. So come on back soon to check for updates, right below this article. Places to place your Ring Video Doorbell Pro order. I didn't actually buy a chime yet, I as I already have old school wireless remote door chimes throughout my home for the at least a decade or so. Not sure I really need another one, since doorbell button pushes already generate an indoor chime near the front door, remote chimes in the basement and 2nd floor, and now, cell phone alerts. Adding a 4th tone might be a bit strange, although the nice feature you get with these optional Ring chimes are the ability to make a custom sound whenever motion is detected. Available at Amazon now as the Ring Wi-Fi Enabled Chime. Interesting to note that Ring Video Doorbell is on Amazon, but the Ring Video Doorbell Pro is not. Not yet anyway. The unboxing video is now available. 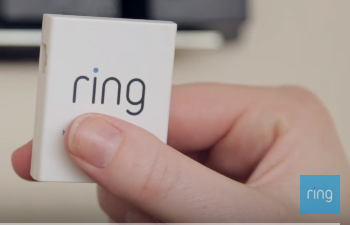 Unboxing of the new Ring Video Doorbell Pro. The Pro Power Kit makes sure that enough power is sent to your Ring Doorbell, and IS REQUIRED for your Ring Doorbell to function. Install the Pro Power Kit before installing Ring Pro outside. It's now rather dark outside. I hope to have a chance to record the indoor and outdoor installation segments, along with the initial configuration and tests, sometime this weekend. 4.98 x 2.43 x 0.87 inches, 12.65 x 6.17 x 2.21 cm. 4.50 x 1.85 x 0.80 inches, 11.43 x 4.70 x 2.03 cm. referring to this cnet article. This last bit is mentioned in my unboxing video above, and tweeted by Richard Gunther @richardgunther of the Home: On podcast. The Pro Power kit ensures that enough power is sent to your Ring doorbell. If you've been lucky enough to get one of the first Pro Power kits, it'll look like this. It's exactly the same part, and it's completely harmless, it just doesn't have a pretty plastic enclosure. Sreenshots from the video demonstrate. Ring Pro Power Kit without cover, indicating my Ring Pro is an early model. 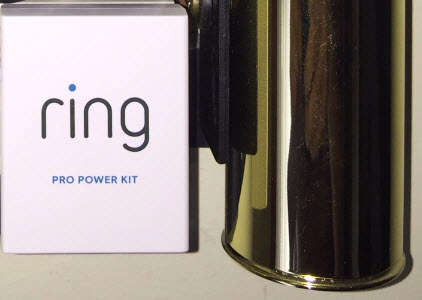 Ring Pro Power Kit with cover, which most people will likely see in their box. As long as the circuitry in both my doorbell and my Power Kit is identical with later manufactured units, this cosmetic difference isn't meaningful. Click here to download a PDF of the instruction manual for the Pro Power Kit installation. This is the same manual you got in the package (unless again you got one of the very first shipments when we were still ironing out some of the kinks in the install manual), but formatted to be viewed onscreen. My unit did include a nicely printed copy of the Ring Pro Power Kit manual. It works! Install and test took well under an hour. This is a rather new device, and not everything at Ring has been updated for the Ring Pro quite yet, including the iOS app's video tutorial about the installation, for example. Hi Susanzmoon, thank you for purchasing a Ring Pro! Ring Pro was placed in retail stores at an earlier date than requested, however, we're in the process of completing a rollout for a firmware update. This firmware update will alleviate many of the issues you have mentioned, and you'll enjoy your Ring Pro experience much more once that firmware is loaded to your device. Firmware updates happen over the air, so you won't have to do anything to receive it; your device will search for any new available firmware daily. The updated firmware version is 1.0.29. I apologize about your initial experience but would like to get in touch with you to address any other inquiries you may have, and assist you further. Please reach me at yul@ring.com today. I checked my firmware in the Ring iOS app, and I'm at 1.0.29. After the most recent firmware update, I do not have nearly the issues that I did the first few days. This week I have still noticed the following: The live viewing feed is more grainy that I would expect from 1080p even though I'm on my home wifi or LTE. The saved video playback is much more crisp. Admittedly, these informal are based on one technician's knowledge, shared on an FYI basis. You are responsible for your own safety, and this information is not intended as any kind of substitute for working directly with Ring support. My home was built in late 1993, and my family and I moved in early in 1994, as the first owners. The home's included electronic doorbell looked like the same one that Ring uses in their install demo videos. It's been since replaced with the pictured mechanical door chime about 15 years ago. Here you'll see I have the Ring Pro Power Kit stuck onto my ~12 year old wireless chime module, using the included 2-sided foam tape. Make sure your wires are tidier than this work-in-progress picture. If you have a mechanical chime, also be sure the plungers that strike the chimes can move without hitting any wires. 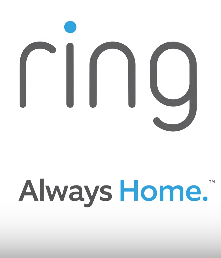 Working with Ring support, we temporarily decided to disconnect both the Ring Pro Power Kit, and my home's wireless chime transmitter modules. This left just the home's original wiring, and the Ring Video Doorbell is now working just fine, for 10 hours straight now. This is not the generally recommended approach for most homes, since that Pro Kit is an amplifier for night vision, and ensures adequate voltage despite the variety of household voltages out there. I measured 18 volts at my 16V transformer's terminals, and where the wires emerge from the hole in my wall at the pictured door chime, so apparently I'm OK as is. It's possible I'll encounter another situation where my doorbell gets stuck in spinning blue circular light pattern again, as was happening when the Pro Kit and Wireless Transmitter were both wired in, only time will tell. In a day or two, I'll probably reconnect my original wireless chime transmitter, and see if everything continues to work well. This morning, my Pro had a the soft white glow LED around the button, but pushing the button did nothing. Tried Live View, failed to connect, yet the attempt showed on the web portal. Tried pinging the Ring's IP, it did respond. Yet, with button pushes, nothing happened. That is worrisome, not a favorable impression to actual visitors, would have to instead knock on the door loudly to get our attention. It is strange that it's even possible for the mechanical chime to not work at all when the Pro is off line for whatever reason, I'll have to watch for whether that ever happens again in my home. Again, there are so many chimes and transformers and voltage levels out there, so my particular story you're reading about here isn't necessarily applicable to you. Before taking any further corrective action, I worked with Ring Support by phone early this morning on next steps. Amazingly, again, no wait on hold time, got a human right away. It would appear likely that 1.0.40 firmware is what Ring had intended to get to all customers at release, but the week early sales at Best Buy really made for a less smooth launch, with beta code all that was really ready. I'm very likely simply caught up in an early adopter rough patch, and you shouldn't necessarily be afraid to place an order now, as I suspect this will all blow over in a day or two. I'll keep updating this post. The technician informed me that at 3:14am today, Ring support internally sees that the latest firmware version 1.0.40 was sent to my Pro. I had noticed that level on my Ring earlier on May 1, but later on May 1st, it went back to showing 1.0.29 again. Not sure why. The theory is that the overnight push of 1.0.29 just didn't go well for my Pro, so Ring support pushed 1.0.40 to my device while we spoke. We confirmed this level stuck this time, even after a reboot (20 second power removal). He assured me that my experience should be much better here forward. So now I wait again, for some hours and days to elapse, to rebuild my confidence. He also explained that if a Ring device doesn't send any messages to the cloud servers, Ring Support notices this, as it would tend to indicate that perhaps the WiFi connection or other issue is preventing that customer's Ring from functioning. for the Pro model. According to arul's utilities, that range is registered to "Vendor (Company)"
Even easier, you can see your MAC ADDRESS on the YOUR DEVICES view in your Ring Account at ring.com/account. I do hope for an optional MFA (multi factor authentication), aka, two factor authentication at ring.com/account soon. I realize any such tightening of security also tends to raise the cost of support, making for greater hassle when folks try to recover their passwords or deal with lost mobile devices. I do wish router vendors would come up with something analogous to the guest network, with persistent connections and no captive portal. That way, Internet of Things (IoT) devices such as thermostats and doorbells could be isolated from your home's WiFi network. Since they're cloud-only accessible anyway, they really don't need to be on your home's same subnet. Such isolation would help reduce the attack surface, since any IoT device represents a potential attack vector. As we've learned from the world of consumer WiFi routers, as the shiny new consumer networking device becomes older and sales cease, there tends to be little financial interest for the vendor to keep the device's firmware up to date, leaving known security vulnerabilities unpatched. The consumer then has little choice but to cross their fingers, or buy a new one. This firmware update concern isn't just a potential problem for companies like Ring, it's also a growing problem for the burgeoning IoT industry overall. Stable, tested firmware updates that quickly patch vulnerabilities are something that really needs solving soon for all IoT devices, ideally years before we start reading how people's homes get hacked through these connected gadgets. See also the since-fixed vulnerability story, Steal your Wi-Fi key from your doorbell? IoT WTF!. For now, I'll have to just stay vigilant about such issues. It's hard to imagine something like Steve Gibson's Multi-NAT Router becoming commonplace anywhere but the geekiest of homes, but we can certainly do better than the way things are today. I also have some more pictures to share, just to give folks a sense of what they might be up against, should they be needing to find their doorbell transformer mounted on their first floor joists that are basement or crawl accessible. Location tends to be inconvenient. I measured my voltage at 18.0 volts with a multi-meter, despite the 16 volt label on the unit. Well within 16 to 24 volt range that the Pro wants. Most folks who experience no issues with installation or operation likely won't need to care where their transformer is located. Given some of the comments I've seen here on TinkerTry, it was clear it was time to break out the FLIR ONE thermal imaging camera. Despite what appears to be poor aiming, had I taken live video, you'd know that I aimed all around the hottest white spots to find the peak temperatures, and all the images are within 1°F of whatever that peak value was. 68°F indoor ambient temperature, before 15 minutes of LIVE VIEW, daytime. 50°F outdoor ambient temperature, before 15 minutes of LIVE VIEW, daytime. 50°F outdoor ambient temperature, after 15 minutes of LIVE VIEW, daytime. iPhone 6 Plus at 68°F indoor ambient temperature, after 15 minutes of LIVE VIEW, daytime. 50°F ambient outdoor temp, after hours of inactivity. I did take a picture of the doorbell, at the same 50°F ambient outdoor temperature this morning, before attempting any LIVE VIEW or any other operations. It was cooler than all subsequent images. It could be that there is some sort of power savings that happen after a number of hours of inactivity, but I'm not sure. It seems to take hours to cool off again after any sort of use, which seems to imply that the device stays active, or, that heat dissipation on a 50°F windless day is very slow. FYI, the Pro's other side, and the bottom and top, run cooler. Because of the relatively close proximity of the FLIR's dual camera images that are superimposed in the app, there is a bit about a 1/2" lateral offset between the thermal image and the visual image. My Pro seems to now be stable, running overnight successfully, with full functionality seen this morning. I actually left the Pro Power Kit attached, and my home's wireless chime transmitter attached, and all is well. I just may be able to leave it alone as-is, we'll see. I'd actually prefer to keep my home's existing wireless chime modules. 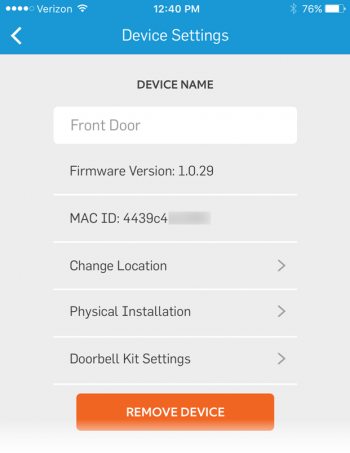 What WiFi networks is Ring Video Doorbell Pro compatible with? Ring Video Doorbell Pro is compatible with 802.11 b/g/n WiFi networks operating on 2.4 gHz or 5 gHz frequencies. Will Ring Video Doorbell Pro on a 5 gHz network work with my Ring Chime on a 2.4 gHz network? Another reason is that my mobile apps make the wind chime noise for me anyway, and is with me pretty much all the time. pca.st/PsVL#t=1097. Effective at generating awareness and interest I suppose, but I can't help but wonder if it's just too soon, given it would appear the average consumer is probably better off holding off on their investment in Ring for at least another few weeks. I say investment, because $250 + $30/yr x 3 years cloud recording = $340 cost of ownership for three years. That's over 1/3 of a thousand dollars. Sure makes you more likely to slog through blog posts like this one before you jump in. I did recently find that my Pro's motion detection has stopped working, as Bruce mentioned below. But my Pro is otherwise functioning fine for well over a day now, as a straight doorbell, and the video answering and Live View functions. I'm currently in a holding pattern, answering various comments, and waiting for whatever firmware comes after 1.0.40. I'll revisit this article once something noteworthy happens, adding new info right below this same article. I'm trying not to pass judgment quite yet, and won't be adding any closing thoughts or bottom line sort of conclusions for a while, not until I've had more time using the Pro to determine how all functions hold up after the next code release. A "Principle Electrical Engineer" at Ring has contacted me to follow-up on my trouble ticket, not because of this blog post, but because of the level of detail and photos in my service request from last weekend. That was back when I was still having an issue with the doorbell not working for more than 15 hours roughly at a time. He is super politely asking some questions about voltage, impedance, wire gauge, etc. I will be happy to work with him. I suspect he's trying to detect patterns that will help Ring correlate the stability problem I was having with 1.0.29 (couldn't run for more than approximately 15 hours) that have since been resolved, once 1.0.40 successfully pushed to my device. I'll be letting him know all that, and will likely still be making the measurements with my multimeter anyway, just in case it helps. 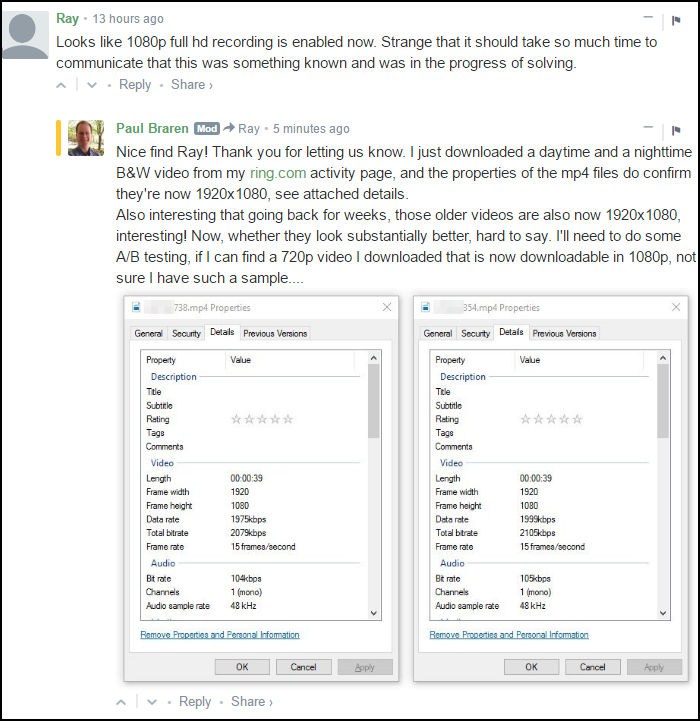 Meanwhile, more good news, my Ring Video Doorbell Pro apparently got firmware 1.0.50 last night, which has seemingly resolved the Motion Detection problem (not working on 1.0.40) that other folks had also noticed, such as as Randy's comment here, right below this article. Perhaps I'm already "out of the woods" and it's possible my Pro's full function and stability has now been obtained. Only time will tell, so I can gain more certainty. Last night, I was a guest on the Home Gadget Geeks podcast and we discussed the Ring Video Doorbell Pro at some length. Playback of audio and video should be available soon. I have noticed that once you've configured your Pro, it sticks with the frequency it joined your WiFi on. In other words, if you have an SSID with the same name for both your router's 2.4GHz and 5GHz frequencies, turning off the 2.4GHz frequency in your WiFi router's configuration leaves you with a disconnected Pro. It won't renegotiate and connect on 5GHz. Just a behavior that's good to be aware of. I do see commenter M Rosa reporting success with 5GHz. 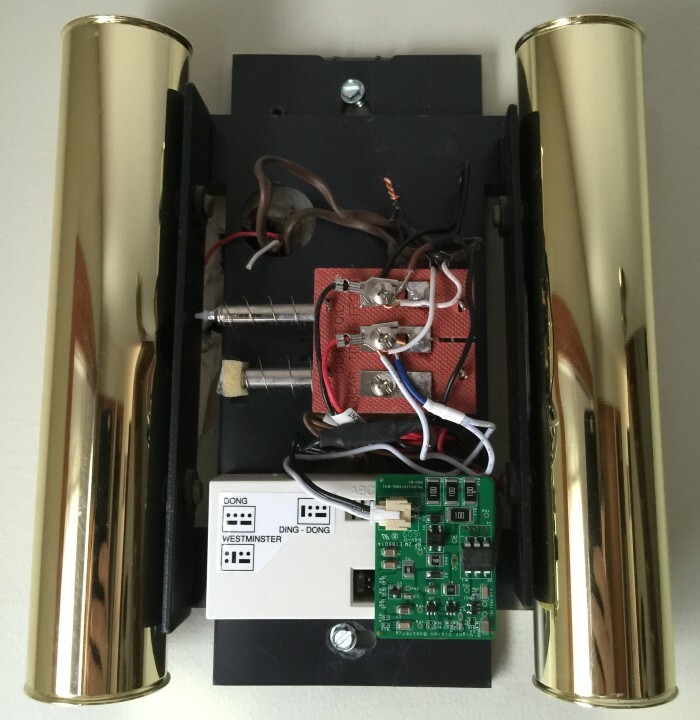 Finally, and update on my three 11-year-old wireless chime modules that I have located in various rooms around my house, to avoid not hearing the doorbell ring. The discolored plastic I noticed due to these Lamson Home Products Model #3730DR plug in chimes running hot is apparently a known issue. As soon as a 5GHz compatible Ring Wi-Fi Enabled Chime is offered, I'll probably go ahead and replace my old ones. 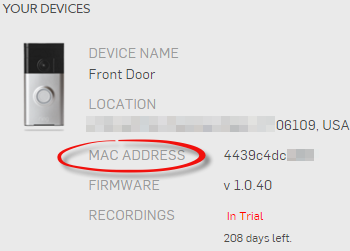 I was getting to many false alarms with 10.0.50 firmware, and as TinkerTry commenter ruderthanyou noted [below]https://tinkertry.com/first-look-ring-video-doorbell-pro#comment-2662403822), you can ask for Ring Support to tune this new default value for you. I did exactly that, and their response was to move my motion setting from 5 to a 3. Given I'm still getting about 5 false alarms day or night, I've now replied with a request to try a value of 2, to see how that goes. where you'll also find detailed shownotes. Even on Mother's Day, Ring quickly changed my motion sensitivity setting to my requested value of 2. Last night, only one false alarm, but it was a logical one. There were some moving shadows cast across the defined area of the image I had chosen, so technically, it worked properly. It's now looking like I may be able to leave motion detection on. Down the road a bit, I do wonder how a heavy snow or wind and rain storm will work out, where I suspect an ability to temporarily mute all Motion Detection alarms for say 12 hours (WhatsApp-style) sure would be a welcome feature. Even better would be an algorithm smart enough to try to discern what is being imaged, distinguishing shadows from people for example, to intelligently decide if a Motion Detection event should be triggered. I like that it would seem such changes could be in the form of simple, automatic firmware updates, for the Pro model. I get a black screen too when not on my home wifi. Sound does work, and recordings work completely. Very frustrating because when I get the notice on my phone that the doorbell is ringing, I can't to anything about it. I am also continuing to work closely with Ring support to ensure I find complete stability with my system. The most important feature of any doorbell is ringing the bell. No, I haven't forgotten that I experienced some problems with reliable ringing, seems a little strange that's even possible, since a doorbell button's only job is to simply close a circuit after all. Stay tuned. This best-effort article by an actual owner, and all advice it contains, are NO substitute for official Ring FAQ or KB articles, see also the Ring Community Support Center > Setup/Installation. Transformer is not 16V or higher. Wiring resistance is too high, due to using CAT wires, instead of bell wire. Connecting up the Pro Power kit incorrectly. For folks experiencing difficulties with reliable operations, again, I encourage you to contact Ring support directly. Just as a precaution, they kindly mailed me a new Pro Power Kit, which apparently has some enhancements in the internal design. The plastic shell doesn't open easily, but it took me only seconds to install. Turns out I personally didn't really need that new Kit in the end. Naturally, it might take them some time for Ring to publish exactly which circumstances warrant their support group recommending a replacement for a particular home's early Pro Power Kit, the device that helps ensure there's adequate power. The engineer was a bit surprised my earlier technician had recommended temporarily disconnecting my Pro Power Kit. He instead recommends that all Pro owners use the kit. ...it's OK if you want to let folks know that the latest Pro Power Kit works better than previous versions. Turns out that with firmware 1.0.29, there was an issue that I (and others) had noticed, where I awoke to find my doorbell dead. That is, I'd push the button, but no ringing of either the mechanical door chime, or the app, occurred. A reboot (power cycle the circuit breaker) brought it back to life for a few more hours, but this certainly shook my confidence. So I gladly worked with the same engineer to measure the ohms of my transformer, with both an energized and powered-off circuits. I moved about doing the measurements, with him on the phone with me, and we quickly had it all measured. By the way, I found out the previous FW release had an issue where the triac inside Pro would be disabled, so that your chime could not possibly ring. I reviewed the numbers you took today, and your wiring resistance is much lower than the value needed to cause the Pro Power kit to fail. Now, I firmly believe the issues you saw were due solely to FW. Now that everyone is running 1.0.50, and have been for a while, the 1.0.29 triac issue is rather moot. Alright, here's the scarier part. This is a screenshot from my authenticated Ring.com login session, indicating when the incident with my audio occurred. I have more to report about this issue soon, with further updates to this article planned for later today. In my case, it's not my video that got mixed up with a stranger, but instead 16 seconds into the recording, while I was on the phone with the engineer actually, the cloud recording suddenly cut over to some other family's front door audio. This is worrisome. I'd rather not publish the actual audio, as it clearly has some other family and kids discussing snacks, and I would rather not have some other family publish video or audio from my family's front door. Of course, I reported this issue to Ring immediately, and am currently awaiting comment. 10.0.62 firmware is out, which apparently seems to cause more night-time false motion detection events than 10.0.50 ever did. I got 8 false alarms last night. I'm not sure if my sensitivity is still set to 2 out of 10, but I think I'll wait until the next firmware comes up before I bother reporting this. By some of the comments here below this article, it appears I'm certainly not alone. At first, yesterday, it appeared as if I had encountered another audio-bug. 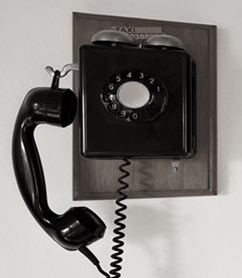 I was in somebody else's car when my iPhone Ring app rang, so I couldn't hear who was at my door very well. It was the FedEx guy, and he didn't seeem to hear me very well throughout our brief conversation, about his second delivery attempt of a package that requires a signature. He wouldn't leave the package, despite my polite verbal request, not without a physical signature. Which was made apparent as he walked away with the package, not by what (little) he said. Upon playback of the interaction today, I realized that another other voice heard during the middle of the video was actually my wife, who had kindly answered the same FedEx delivery ring at about the same time as I had. I hadn't heard that other (quieter) voice from the car yesterday. Even when listening to this playback repeatedly, the audio quality is poor enough that it was hard to discern who they mystery voice was at first. Certainly a strange circumstance for the FedEx guy, hearing two voices, both asking if we could help him. 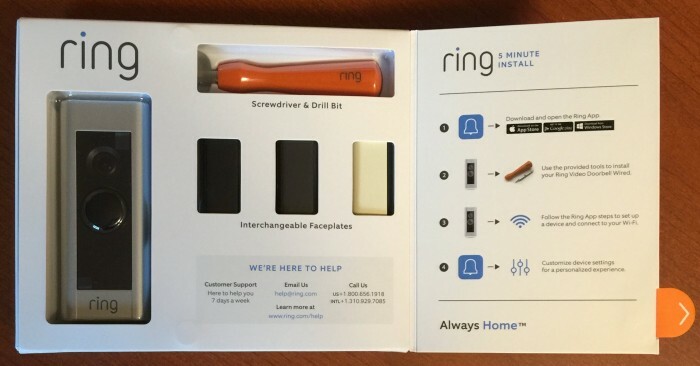 Seems like Ring might want to consider a first-come first-serve setting. These sort of mixups are likely to happen again, particularly as a multi-family household gets used to having a video doorbell to answer. Coordinating among family members isn't simple, especially when answering from two different locations. Here's how I'm feeling after a rough few weeks of firmware updates. I noticed some of my nighttime videos recorded from motion detection now start dark for a second, then the LED emittors light up, and I can then see a large dragonfly hovering lazily around. This is a new behavior, with previous night recordings illumunated all the time. This would seem to indicate the emittors are no longer blasting out the entire night, or perhaps even 24x7. 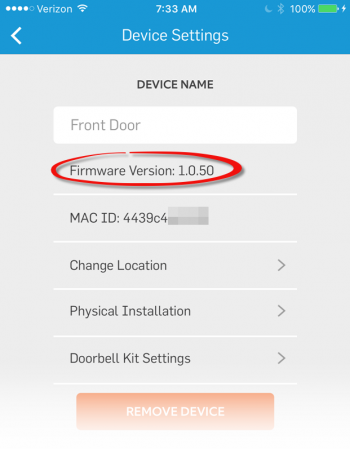 Update: My Ring Video Doorbell Pro performs WAY better with this firmware update! The video feed loads in like 1-3 seconds no matter if I'm on wi-fi or LTE, awesome. Also as you guys already said false alamrs are almost completely gone. As for the cloud recordings, still 720p video for downloaded files, versus the 1080p in the Pro specs. Awaiting word from CEO Jamie Siminoff. To everyone who uses his Ring Video Doorbell / Doorbell Pro with an Apple Device. Something pretty awesome was just "announced". Apple Homekit gets new features like video preview notifications on the lockscreen, so you can basically see who's at the door by having a quick look at the lockscreen of your phone. @airkareem Hi Ben, we're excited to bring HomeKit support to Ring later this year so please stay on the lookout! If this is going to work as good as it sounds it will be an awesome new addition. Craig Federighi gives a quick preview of iOS 10 and a video doorbell, with live video right on the lock screen of your iPhone. I just wonder if it's possible to add homekit to the existing ring products via software update or os homekit needs new hardware. I think I've heard that homekit requires some additional hardware, I'm not sure on that one though. I'm a fellow Ring Pro owner and while I would really like the addition of HomeKit I think it might be helpful to keep something in mind: Because of the way HomeKit works, certain hardware must already be built into the Ring Pro. It seems unlikely to me that our current RIng/Ring Pro's are going to be able to work with HomeKit. 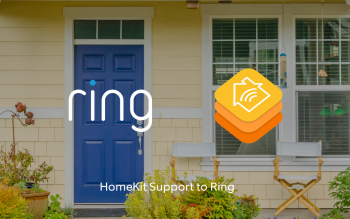 What is much more likely is that Ring is going to "bring HomeKit support to Ring later this year" buy selling a new version of the Ring Pro that we would have to purchase in order to have the HomeKit feature. Ring will already know whether this is the case or not so it should be pretty easy to verify. Does the new Ring Video Doorbell Pro include the hardware that would allow for an eventual Homekit-capable firmware upgrade? This blog is a fantastic resource for Ring Pro/Ring owners! Thanks for your follow-up and the confirmation that Ring Pro has the MFi chip required by Apple for HomeKit compatibility. Of note, I'm not certain about this, but it does look like (non-RingPro) the regular Ring door does not have the chip necessary for Homekit comparability. You can read all about MFi at Apple here, with further confirmation of Ring Pro's MFi here. Last straw was today, when the doorbell didn't work. That's right, the house's door chime didn't ring after pushing the Ring Pro button. Found this out the hard way, when my wife had a visitor who knew now to push a button, but got no result. Not good. Those are the technology fail moments we all wish to avoid. This circumstance was much like what had happened during the first 2 weeks, with the known TRIAC-related firmware bug. Only this time, rebooting the Pro didn't help, you know, flipping the circuit breaker off, waiting 20 seconds, then flipping it back on again. Hmmm. I then remembered the discussions about 16 volt versus 24 volt transformers during those Ring Support troubleshooting calls. It was mentioned that I should consider a 24 volt transformer, should I run into problems. So today, it was time to finally install that just-in-case 24V transformer, something I've been meaning to do for weeks. I simply hadn't prioritized it, since things were working so well all of June with that 1.1.30 release. Ta-da! I now have a way to measure watt use easily, and a way to (hopefully) have reliable good old-fashioned doorbell ringing again. So far, things seem to be working normally again, including Live View. Once I'm convinced things are good, I'll make the installation of the transformer more permanent, making sure to follow the included instructions which warn that the screw must be used to keep it securely in an outlet. Only time will tell if things are stable again, as they were for all of June, right up until yesterday. Will keep you posted. MG branded Class II 24 volt Transformer, reads 26.09 volts AC on the multimeter. 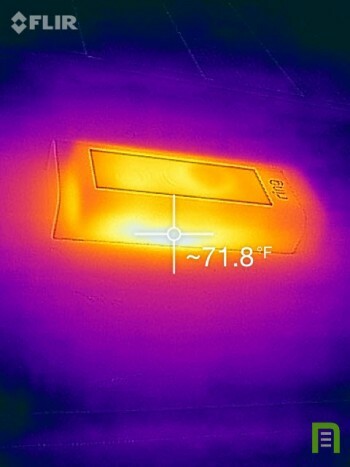 In the daytime, when presumably no IR blasting is happening, roughly 6 watts shown at idle. When answering a Ring Pro doorbell push, briefly the chime and Ring Pro together are consuming 16.3 watts peak. This spike lasts for just a few seconds. At night, the IR blaster emits some visible light reddish light, using 7.1 watts at idle, or 7.4 watts during a Live View. So roughly one watt is apparently all that's needed to illuminate the night. For my front yard, that infrared light reaches an impressive ~60 feet away! Overall I'm happy with my buying decision. 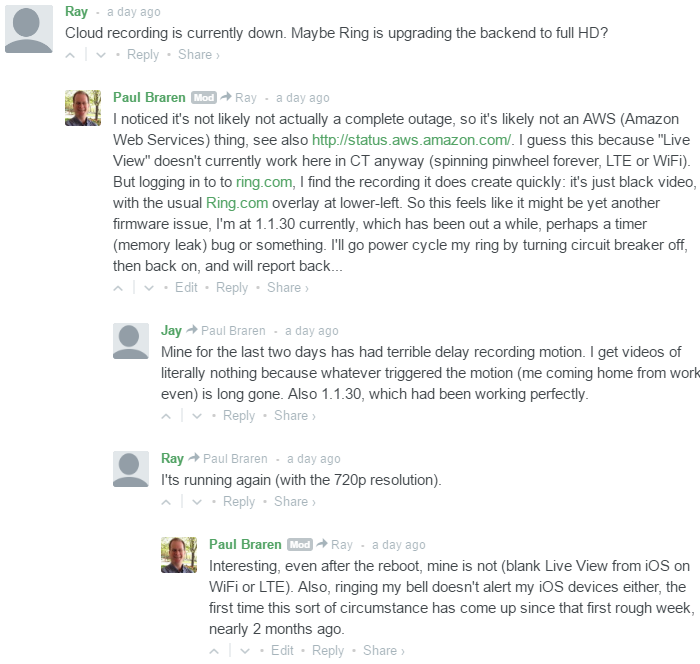 the firmware (that Ring automatically updates) was refined to avoid missed button pushes. my original solid copper doorbell wiring, combined with a new 24 volt (instead of the original 16 volt) transformer, got me reliable mechanical chime ringing, so that all visitors were known to us. The latest firmware seems to eliminate most of the spurious false alarms for my particular installation at my home, about three false alarms a week, where reviewing the video shows no obvious reason why the motion detection was triggered. Commenters seem to have observed similar improvements. The speed at which it decides to record a movement event has improved over the earlier firmware, and over the first Ring (non-Pro) Doorbell. This has reduced the number of times I just see UPS or FedEx walking away from the house. I still get false negatives, where somebody leaves a package, and the Pro fails to record the motion, so I may need to have my sensitivity cranked up a bit. The iOS Ring app is a bit buggy, occasionally acting as if you've been logged out, just force-quit and restart and you're back in action without authenticating. This behavior isn't very reassuring, and this might affect your ability to receive alerts reliably. If your home's original doorbell is thinner-gauge CAT5 cabling that cannot be easily replaced, you are more likely to have issues, especially if you still want your original doorbell chime to sound. Not sure it would even be safe to step up from 16 volts to 24 volts, please read Understanding Resistance and How To Install Ring Doorbell Pro without a doorbell direct to 16-24 VAC Transformer, and contact Ring Support directly. You can't seen packages left below the camera view, which is probably true for nearly everybody. Since my motion detection is unreliable, it would seem that just a little video recording buffer memory would allow it to cloud record not only the doorbell push, but also the 15 seconds leading up to that button push. Not sure if this is something Ring can resolve with a future software update. Ring needs to reply to my inquiry about the 1080P capability that the various podcast and online ads I see almost daily still claim. As of now, cloud recordings are still 720P. Even better would be a public post on their blog. To better reject false motion alarms, what would likely be needed would be customer assisted AI, where human customers would visit the cloud recordings, and select which show movement of the kind you want to know about. This assisted learning could help the Ring Pro itself learn the behavior you would like it to exhibit. Not sure there's enough smarts or processing power in this current generation to do all that work locally. Remember, it's not streaming to the cloud until it decides it needs to. For these prices, the next generation Ring doorbell needs to have a higher quality button with tighter tolerances, treating visitors to a more premium tactile feel. I would prefer a full 180° field of view, both horizontally and vertically, where the cloud recording would capture the entire field of view, and the app and cloud recordings at ring.com, would both allow you to pan down as needed, to see what is resting below the camera. I confirmed. It is all 1080p except for the storage. So the box and all of the materials are correct. We have never told people what file sizes we store. Received a comment here at TinkerTry by Ray, right below this article, it would seem your existing cloud recordings are now in 1920x1080p! First, let me say that customer service at Ring has always been very, very responsive: no complaints here on that. Electronic circuits are generally engineered to tolerate max voltages. Because transformers emit more than the rating, someone there at Ring must know what that upper end is. So here is the thing about transformers. When the load is open circuit, or a light load, the voltage you get will always be higher than what the label says. For instance, for a 16V transformer, it would not be unusual to see as high as 24V at the output. For a 24V transformer, I might see 36V. There is nothing wrong with this, and we have accounted for this in our design. The output voltage will drop as the load current increases. 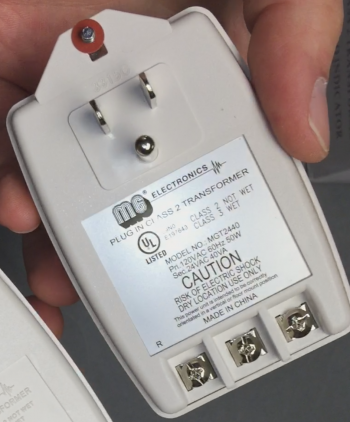 The voltage will be approximately what the label says, at the rated power level of the transformer. If the wattage rating is 20VA, this is 20Watts. For a 24V 20VA transformer, I would expect the voltage to be about 24V when the current in the load is 0.83Arms (20W/24V). 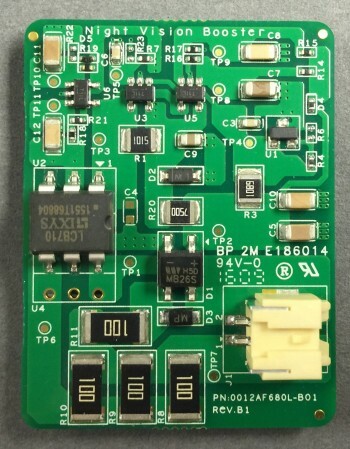 There is variation between manufacturers, in how much the voltage drops with load current, and what the no-load output voltage is. 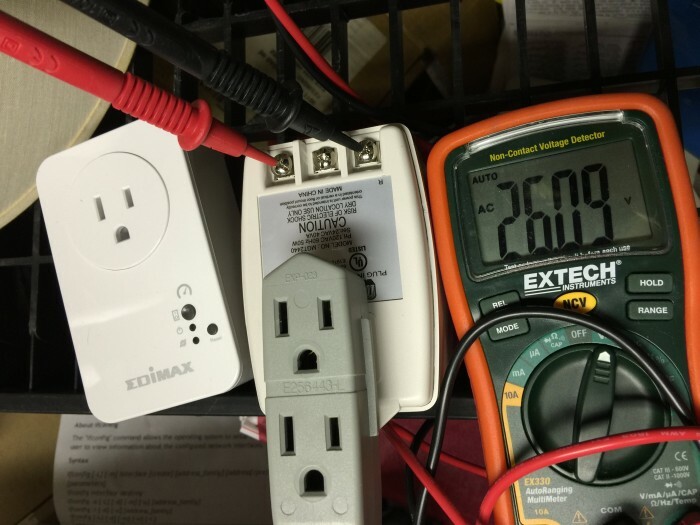 These "specs" for output voltages are only rough numbers, and are intended to be interpreted as under the rated wattage condition. The Pro unit will draw less than the rated wattage of the transformer, so the measured voltage with Pro attached will be higher than the voltage label on the transformer. So what the CS person said is correct. Stick with a 24V transformer and all will be good. He didn't say the following, but it is implied: "Go with a transformer rated higher than 24V, then all bets are off." I was away on a trip to VMworld, and awaiting the arrival of a package back home. Even though a family member was home, it would have been handy to be notified when UPS rang the bell and left a package. Unfortunately, while on this trip, I found that Live View wasn't working. I had planned to remove power to the Pro, then plug it back in again, just in case this would fix it. My name is [redacted name] from Ring Community Support. 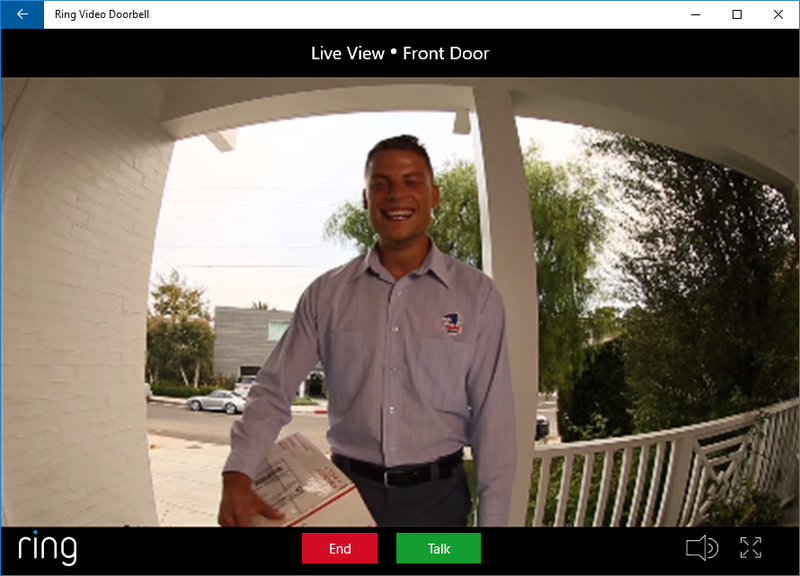 I just noticed that your Ring Pro doorbell went offline and can’t reconnect to our servers, so we’re sending you a brand-new Ring Video Doorbell Pro as a replacement. We apologize for the inconvenience, and we want to assure you that this is an isolated incident that won’t happen again. When I got back home, I noticed that pressing the Pro's button didn't ring my home's mechanical chime. That's not good. Of course, I unplugged power from my Pro for several minutes, yet it still didn't come back to life. Because of the holiday weekend, it turns out I'll have to wait until Thursday Sep 8th for my replacement, which will make things a bit awkward for visitors to my home this week. But I am glad Ring is taking care of this, at no charge to me. The new Pro arrived. Before tapping the REMOVE DEVICE button in the app's Device Settings page, I noticed it was at Firmware Version 1.1.30, and after giving the new unit about 15 minutes to settle down, it's at 1.2.23. Does this mean that only the newer Pro that I have can take this newer firmware? I don't know. My cloud recordings no longer show under Recent Activity, and I'm getting that pesky orange warning message, "Your Cloud Recording trial ends in 30 days. Click here to sign up now." I notice that my field of view now has more curved black plastic obscuring the left side of the frame than the right, so it would appear my new Pro's lense is mounted slightly off-center. Everything does seem to be working again though, including Live View over WiFi and LTE. My mechanical door chime is working too. I sent a note to support to ask to fix my cloud subscription up, and now I wait and see how things go as far as reliability. My Ring Pro continues to operate just fine, and uneventful year since my last update here. This is good. > I see that the Ring Protect system can act as a burglar alarm and an intruder detection system. Can it also detect fires and carbon monoxide? Yes, Ring Protect can also trigger fire and carbon monoxide alarms but only if you’ve installed a FirstAlert Z-Wave Smoke/CO Alarm. As a part of Ring Protect Plus, if your alarm is triggered due to fire or carbon monoxide detection, fire rescue will be immediately dispatched. If you’re enrolled in self-monitoring and your alarm is triggered due to fire or carbon monoxide detection, you will only receive alerts that you’re system alarm has gone off and you will need to take action yourself. Darn, it won't work with my 5 year old First Alert Wireless Interconnected system, with the Insteon 2982-222 Smoke Bridge. It's now 19 months since I first installed my Ring Video Doorbell Pro. Am I still happy with my purchase overall? Yes. That said, I need to point out that it failed to ring the house's indoor chime on Thanksgiving Day, when one of our youngest guests arrived. It seemed to work fine the rest of the day, perhaps the button just wasn't pushed hard enough. But from the video playback, that sure doesn't appear to be the case. It didn't register a button push at all, since it didn't say Missed Ring or Answered Ring in the App. I didn't have the time to adequately troubleshoot, and it seems to be continuing to work well the rest of the year. Just one data point, but a little disconcerting nonetheless. I suspect other owners share similar experiences. It's not a perfect product, but it sure beats not having one at all. The original wireless/battery equipped Ring Video Doorbell has a new revised version 2 that might address many of the shortcomings I noticed with the original version, but I have not tested it. It's still using the same much larger housing that accomodates a battery inside, but for folks without an option to do a wired doorbell, it might be alright. The Ring Video Doorbell 2 is available at Amazon. Chime Pro (Ring Extender)? Test your Wi-Fi first. 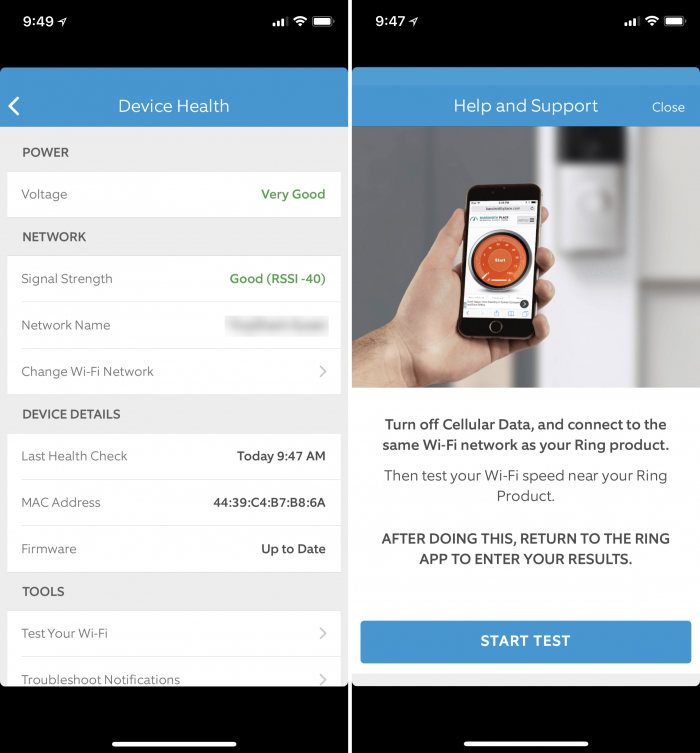 If you already own a Ring Video Doorbell and have the Ring App installed, then you now have some built-in tools to help you figure out if your Wi-Fi is marginal, seen in these screenshots. Note that the app hasn't been optimized for iPhone X yet, with large black areas at top and bottom. where I received much more reliable and consistent results, particularly for downloads. Your results may vary. A deep dive into the installation and long-term use of this friendly Canadian thermostat, with optional multi-room temperature detection. 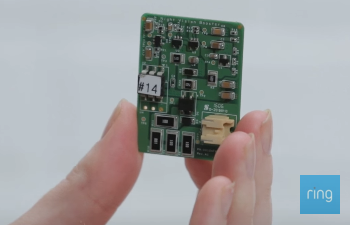 Steal your Wi-Fi key from your doorbell? IoT WTF! The new video doorbell features a revised design. The unit is 1.8 inches wide, which is significantly narrower than its 2.45-inch predecessor. Jim kindly gave TinkerTry a shoutout at this spot in his recent podcast right at this spot pca.st/NFe1#t=3794.